It's finally summer...which means it's time to party, soak up the sun, and have a lot of fun! 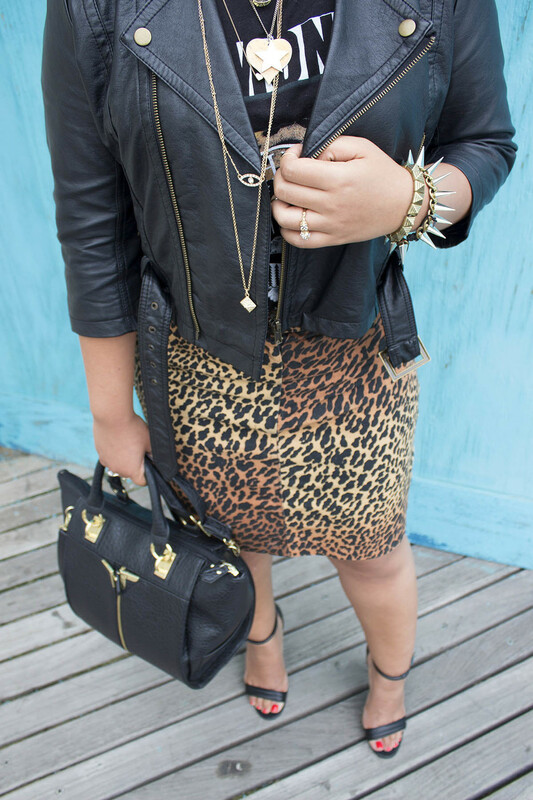 It's time to bring out the wild prints, short skirts, and layer up with gold jewels to bring out that gorgeous tan. This Ramones rocker tee is one of my all time favorite shirts I own. I wear it all year round and pair it up with so many different pieces in my closet. I've been saving this cheetah printed denim skirt for years now! This was actually my moms skirt back in the 80s. Although it's summer, the nights can still be a bit chilly so this cropped faux leather jacket ties the look together perfectly. It makes the rocker look complete. I absolutely love wearing gold jewelry in the summer because it brings out my tan! I'll either load up on a ton of jewelry, or keep it simple with a statement piece. With this look, it felt right to load it up. I'm wearing two necklaces that actually look like 5 because of the multi tiers. I have two spiky stud bracelets and 6 rings ( I love mid rings too). "Fashion is the most powerful art there is. It's movement, design, and architecture all at once. It shows the world who we are and who we want to be"
Fashion is constantly inspired by art. Whether it's through color, dimension, shapes, etc., art is a major influence in the fashion industry. A clear translation between the two is through prints. Many designers are known for their artistic prints. Especially Milly! Her prints are so gorgeous! They are always really interesting with rich colors and graphics. That's why when I found out that Kohl's had a collaboration with the brand, I knew I had to grab a few pieces. Prints can work on their own but they're so fun when paired up with another print! It works when the prints are opposite from each other (like the florals and stripe combos I wore). You also want to make sure the colors compliment each other (safe colors are black and white because they go with everything). I'm going to an Artist Talk tonight so I thought I'd wear something a little artsy. Learn more about the event and artist at Silence is Accurate.